Ms. Jennifer Lynn Lopez, born in 1969, started from humble beginnings in New York. At age 19 Lopez paid for singing and dancing lessons since she wanted to enhance her skills in both areas. Shortly after her lessons, Lopez became a “Fly Girl” dancer in 1991 on the comedy program, In Living Color for seasons 3 and 4. Then she became a backup dancer for Janet Jackson. After the dancing gigs Lopez got into acting. She appeared on shows such as South Central in 1994, which was cancelled in its first season, and guest appearances on Second Chances and Hotel Malibu. She also appeared in Nurses on the Line: The Crash of Flight 7, a television movie which aired in 1993. Then in 1995 she landed her first big screen role in the film Mi Familia (My Family) alongside actors such as Jimmy Smits and Edward James Olmos. After Mi Familia, Lopez starred in Money Train in 1995, Blood and Wine in 1996, and she appeared in Jack in 1996 as well. Also in the year 1997 Lopez appeared in horror film Anaconda and the crime film U Turn (based off of the book Stray Dogs by John Ridley). The following year, Lopez starred opposite of George Clooney in the film Out of Sight. This is still considered one of her most acclaimed roles, and not only did she receive many positive reviews for her performance, this film also launched her to becoming the first Latina actress to earn over $1 million for one role. She also received her second ALMA Award for her performance in this film. In 2000 Lopez starred in the thriller The Cell. Then she appeared in the romantic comedy The Wedding Planner and the supernatural romance Angel Eyes. In 2002 brought on the thriller Enough and the romantic comedy Maid in Manhattan. Maid in Manhattan was considered a box office hit, opening at number one. This is the second film that opened at number one, the first being The Cell. In 2004 she appeared in Shall We Dance? In 2005 she appeared in An Unfinished Life and Monster-in-Law. In 2006, Lopez ventured into the world of producing when she worked on and starred in two independent films. First one was El Cantante, a biopic about the history of salsa dancer Hector Lavoe, was well-received at the Toronto International Film Festival in 2007. Then Bordertown, a film inspired by the true story of female homicides in Ciudad Juarez and the American reporter sent to investigate them. This film did well at the Brussels film festival. The most recent film Lopez appeared in was the 2010 comedy, The Back-Up Plan. Acting is one of many talents Lopez possess. Lopez is mostly known for her music career which began in 1999. Her debut album, On the 6 not only reached the top ten of the Billboard 200, but it also featured the number-one lead single from the Billboard Hot 100 list, “If You Had My Love” and the top ten hit, “Waiting for Tonight.” She also had two songs on this album that became Grammy nominations. The first was a Spanish-language duet with Marc Anthony entitled “No Me Ames.” “No Me Ames” not only went on to reach number one on the U.S. Hot Latin Tracks, it also received two Grammy nominations at the 2000 Latin Grammy Awards for “Best Pop Duo/Group with Vocal Performance” and “Best Music Video”. The second song, “Let’s Get Loud” was the final single and earned her a Grammy nomination for “Best Dance Recording” in 2001. Her fourth album Rebirth was released in 2005. This album wasn’t as successful as her previous ones and it only brought one single, “Get Right.” In 2007 she released Como ama una Mujer, which was her first album she sung in Spanish. This album reached the top ten on the Billboard 200, number one on the U.S. Top Latin Albums and reached the U.S. Latin Pop Albums charts. After Como ama una Mujer was released, it wasn’t even a full year before Lopez’s next album, Brave came out. After Brave, there was a four year lull in Lopez’s musical career. Earlier this year Lopez released her latest album Love?. From this album came the lead single “On the Floor.” This single was the first in eight years to garner Lopez a spot on the Billboard Hot 100, landing at number 3. Outside of her career, Lopez has a clothing line, a perfume line, and a production company called Nuyorican Productions. Lopez is also largely into philanthropy. She has participated in events helping the Children’s Hospital Los Angeles, and in 2009, she formed the Maribel Foundation. The Maribel Foundation is designed to support the Children’s Hospital Los Angeles. Lopez dedicates time for causes such as the promotion of whooping cough awareness, and her film Bordertown garnered her many thanks and awards including the Artists for Amnesty International Award. Lopez has been recognized as one of the 100 Most Influential Hispanics by People magazine in 2007, and she received a Women in Film Crystal Award in 2006. The Crystal Award honors outstanding women who have helped expand the role of women in the entertainment industry. Currently Lopez is sitting in as a judge on the American Idol panel. She’s also set to appear in the 2012 film What to Expect When You’re Expecting. Ms. Selena Quintanilla-Perez was born in the year 1971. Although her life was short she accomplished so many things and her music continues to live. Born in Texas, Selena’s career began at home when she and her siblings started the band Selena y Los Dinos. Selena was only nine years old when they started the family band. The band didn’t perform outside of the family restaurant, but when the restaurant and the family went bankrupt, Selena’s family packed up and moved to Corpus Christi, Texas. I n Corpus Christi, the family continued to perform their music at various venues. Then in 1984 Selena recorded her first album, Selena y Los Dinos, through Freddie Records, owned by Freddie Martinez. Though Selena’s first language was English, she had learned to sing in Spanish and recorded this album in Spanish. The album wasn’t sold in stores and Martinez didn’t see how Selena could break into Tejano, a genre dominated by men. This same album was also released a decade later under the name Mis Primeras Grabaciones. A year later Selena released her second album, The New Girl in Town, released on Cara Records. The following year, in 1986, she released her third album, Alpha, followed by Muñequito de Trapo in 1987. Selena was awarded “Female Vocalist of the Year” at the 1987 Tejano Music Awards. It wasn’t a surprise when she continued to win in the same category for the next several years. After winning several awards Selena released another album, And the Winner Is… 1988. Her last two independent albums were Preciosa and Dulce Amor. In 1989, Selena was offered a contract from both Sony Music Latin and Capitol Records/EMI music. At the time though, Sony had several Tejano artists signed with them and EMI didn’t so Selena was the first to sign with EMI in this genre. In the same year she released her first studio album called Selena. This was also the first album to headline her as the artist Selena rather than Selena y Los Dinos. From this album came the single “Contigo Quiero Estar” (“With You, I Want To Be”) which became the artist’s first single to ever appear on any music chart. In fact, it appeared on the Billboard chart. Following the release of Selena, the artist released Ven Conmigo (Come With Me) in the same year. Remarkably, this album was the first Tejano album recorded by a female artist to ever achieve gold status for high sales, roughly about 500,000 albums. The album remained on Billboard‘s Regional Mexican Albums for fifty-six straight weeks, an accomplishment also previously unaccomplished by a Tejano artist. In the ’90s, Selena released four more albums; Entre a Mi Mundo (Enter My World) in 1992, Selena Live! in 1993, Amor Prohibido (Forbidden Love) in 1994 and Dreaming of You in 1995. Entre a Mi Mundo reached number-one on Billboard’s Regional Mexican Albums chart, and it also entered the Top Latin 50 chart. From this album came the song “Como La Flor” (“Like a Flower”), which peaked at number-one on the Latin charts. More importantly, this is the single that helped solidify Selena’s acceptance by the country of Mexico. Selena Live! earned her a Grammy at the 36th Annual Grammy Awards for the category of “Best Mexican-American Album”. This album also sold more than two copies, and making Selena the first Tejano artist to ever win a Grammy. Selena went on to top several Latin music charts, win more awards,headline in a sponsorship tour with Coca-Cola (with whom she’d signed a contract with in 1989 to be one of their spokespersons for advertising in her home state of Texas), and expand the Tejano Music Movement across the country. Thanks to these accomplishments, her label, EMI felt that the artist was ready to release a crossover album. With this decision reached. Selena went on to sign with a company called SBK Records. Outside of her musical career, Selena created a line of clothing that sold in two boutiques in Texas. She was also signing on to do commercials for brands such as Southwestern Bell’s Call Notes voice-mail system and Dep Corporation’s Agree shampoo. To honor her loyalty with Coca-Cola, the company released a special commemorative bottle. Nearly 5,000 bottles were created and sold in 1994. Selena was also in discussions for creating her own line of perfume,. She was also negotiating to become a star of a new telenovela. Selena dedicated much of her time to her acts of philanthropy. She helped with charities such as Toys for Tots and the D.A.R.E campaign for schools. She held several benefit concerts and free concerts so that everyone would have the chance to hear her music. She traveled around the state of Texas to speak to children about staying in school and discouraging them from ever trying drugs and alcohol. S he also not only planned a fundraising concert to help AIDS patients, but she was also donating her own money for the HIV/AIDS research programs in the country. Unfortunately, Selena’s life was tragically cut short in 1995, at age 23, at the hands of a woman named Yolanda Saldívar. Saldívar originated as the president of the Selena fan club and then she was the manager of Selena’s boutiques. It was later discovered that Saldívar was embezzling money and she was shortly fired. Saldívar had stolen not only money, but financial papers from the singer. Selena met with her to obtain the papers and when she did Saldívar shot Selena. Selena’s death struck a cord throughout the country and the news spread rapidly. Her death was front page news for The New York Times for two days straight. 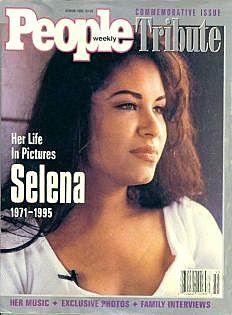 People magazine released a commemorative issue honoring and highlighting the late Tejano singer; it sold nearly a million copies within two weeks. In honor of Selena’s death, a biographical film was released two years after the incident starring Jennifer Lopez in the titular role. The film was nominated for six ALMA Awards, a Grammy Award, A Golden Globe Award and an MTV Movie Award. Selena’s death also affected the entire state of Texas. In addition to the film, her life was also chronicled in the musical Selena Forever which appeared in 2000. Governor George W. Bush not only declared April 16th as “Selena Day” in the state, he also signed a law legalizing carrying a concealed weapon in the state of Texas, a law that passed after a 124 year-long-ban. Selena was inducted into the “Latin Music Hall of Fame” in the year 1995, and in that same year, the Selena Youth Center was founded. This center is designed to assist young women reach their goals and become productive. Worldwide, Selena has sold roughly 52,300,00 copies of her albums. She’s still regarded as the “Queen of Tejano” and she’s among the best-selling artists in the United States to this day. Ms. Eva Jacqueline Longoria was born in 1975. Longoria originally wanted to be a model, but after being told her height was not desirable she pursued other endeavors. While she was in college a theatrical agent spotted her and signed her up as talent for his agency. Longoria’s first appearance on television was a guest-starring role on the show Beverly Hills 90201. She also had a guest appearance on the soap General Hospital and it was this appearance that launched her career in television. Then in 2001, she joined the cast of the soap opera The Young and the Restless as Isabella Braña Williams. After her two-year run on The Young and the Restless, Longoria appeared in 2003 on the crime drama series Dragnet. Dragnet was cancelled shortly into its second season. Following this show, in 2004, Longoria appeared in the direct-to-video film Senorita Justice and the television movie The Dead Will Tell. Neither of these two roles were well-received by critics. During her run on Desperate Housewives, Longoria appeared as a guest star on shows such as George Lopez in 2006 and Children’s Hospital in 2008. She also had roles in films such as Harsh Times in 2005, The Sentinel in 2006 and The Heartbreak Kid in 2007. In the year 2008 she headlined in the comedy film, Over Her Dead Body as Kate, the ghost of a bride-to-be who has unfinished business with her fiance. Outside of her career, Longoria opened a restaurant in Hollywood with Todd English in 2008 called Beso. In 2009 another Beso was opened in Las Vegas and for the restaurant to blend with the Vegas lifestyle they added a nightclub. In 2011 Longoria published a cookbook entitled “Eva’s Kitchen: Cooking with Love for Family and Friends.” Then in 2010, Longoria launched her own fragrance line, Eva by Eva Longoria. Longoria is currently in production on the film Cristiada for 2011 and Baytown Disco set for 2012. She is on the 8th season with Desperate Housewives and this will be the final season for the series. Mr. George Lopez is a man whose career has taken him to great heights, giving him a chance to work in radio, television, film and stand-up comedy. Born in 1961, Lopez was raised in Los Angeles and by his grandmother and step-grandfather. Lopez’s specialty has always been comedy. By the late ’80s, Lopez was starting to garner the attention of the entertainment world via comedy clubs and TV specials. The entertainment industry did take note and casted him in supporting roles for both Ski Patrol and Fatal Instinct. Shortly thereafter, Lopez was approached by Sandra Bullock. Bullock was looking for someone to assist her in getting a sitcom on air that starred Hispanics for an American audience. Once the two met the George Lopez show was created. Lopez produced, wrote and acted in the show. The George Lopez show made Lopez one of the few Latinos to ever star in a television comedy series. The show ran for six seasons, entering syndication in fall of 2007. The show received several awards during its run, including but not limited to an Emmy Award for “Outstanding Art Direction for a Multi-Camera Series” in 2005, an Imagen Awards for for “Best Primetime Comedy Series – Television” in 2003 and “Best Primetime Series – Comedy” in 2004. Lopez also received an Imagen Award for “Best Actor – Television” in 2004, and nominations for the same category from 2005-2007. While the George Lopez show was on the air, Lopez went on to appear in various guest roles in shows such as Freddie, The Naked Brothers Band, and Curb Your Enthusiasm. He also had several film appearances in Naughty and Nice, The Adventures of Shark Boy and Lava Girl, Tortilla Heaven, and Balls of Fury. When the George Lopez show ended in 2007, Lopez went on to lend his voice to the Disney film Beverly Hills Chihuahua, starring alongside Drew Barrymore. Lopez also did voice overs for films such as Marmaduke, Beverly Hills Chihuahua 2, Rio and most recently The Smurfs. In 2009 Lopez was back on TV, only this time for his own late night talk show, Lopez Tonight. His talk show aired on TBS and the last show aired August of 2011. Alongside his television career, Lopez was still doing stand-up comedy. He started to record comedy albums as well, and his album Team Leader was nominated for a Grammy Award for Best Comedy Album in the year 2004. He also appeared in the HBO specials America’s Mexican and Tall, Dark & Chicano. Outside of his career, Lopez runs his own charity called the Ann & George Lopez Foundation. The Charity’s mission is to…”Create positive, permanent change for underprivileged children, adults and military families confronting challenges in education and health, as well as increasing community awareness about kidney disease and organ donation.” Lopez received the Manny Mota Foundation Community Spirit Award, the Artist of the Year and Humanitarian Award by Harvard University in 2004, the “Spirit of Liberty Award” from People for the American Way, and the Latino Spirit Award for Excellence in Television in 2003. He was also named one of the Top 25 Hispanics in America in 2005 by Time magazine. Lopez will next be seen in 2012 in the film April Apocalypse. Check out the IMDB here. Ms. Salma Valgarma Hayek Jimenez de Pinault was born in 1966 in Coatzacoalcos, Venacruz, Mexico. Hayek was introduced to the entertainment industry at an early age due to her mother, Diana Jimenez Medina, being an opera singer and talent scout. However, it wasn’t until after her attendance at Universidad Iberoamericana that she chose to seriously pursue acting. Fame came to her in Mexico at the age of 23 when she landed the titular role in a Mexican telenovela entitled Teresa. She stayed on the show for two years, from 1989-1991. She also starred in the film, “El Callejon de los Milagros” (translated to “Miracle Alley”) which has been cited as the most successful film in the history of Mexican cinema due to the amount of awards it has received. Despite her fame in Mexico, Hayek dreamed of bigger things and went on to Los Angeles to pursue an American film career. To her disappointment, most studios at that time were cast-typing Latinos into bit roles. Then in 1992 she caught the attention of Rober Rodriguez and Elizabeth Avellan. The pair cast Hayek in the lead role starring opposite of Antonio Banderas in the second film in the El Marachi trilogy, Desperado as Carolina. She was nominated for a Saturn Award for Best Supporting Actress, and she reprised this role in 2003 for the last installment of the trilogy, Once Upon a Time in Mexico. In the year 2000, Hayek founded her own production company under the handle Ventanarosa. She was successful on the production side, and the first feature she produced in 1999 El Coronel No Tiene Quien Le Escriba was her home country’s official selection for submission for “Best Foreign Film” at the Oscars that year. In 2002, Hayek co-produced and starred in a film called Frida. Frida was considered a cinematic success and received several awards and nominations, including an Imagen Award win for Hayek as “Best Actress – Film”, a Golden Camera Award win for “Best International Actress” and nominations for an Academy Award, a Golden Globe, and a Screen Actors Guild Award for similar categories. On the acting side of things in the 2000s, Hayek also appeared in films such as Traffic (2000), In the Time of the Butterflies (2001), After the Sunset (2004), Across the Universe (2007), Cirque Du Freak: The Vampire’s Assistant (2009) and Grown Ups (2010). Hayek also has worked in the television field. Outside of her acting and producing career, Hayek has served as a spokesperson for Avon cosmetics since 2004. 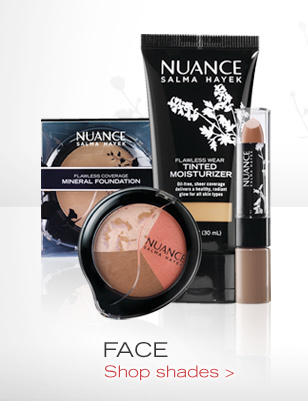 Then Hayek launched her own cosmetics line called NUANCE by Salma Hayek. These products will be available nationwide at CVS pharmacies. 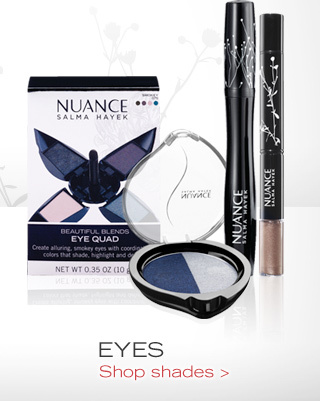 Out of curiosity I bought a few of her products and thus far I love the NUANCE eye serum. Hayek is dedicated to bringing awareness on violence against women and discrimination against immigrants. She donates money to various shelters and causes based around anti-domestic violence. She also serves as a board member of V-Day, a non-profit charity designed to raise money to benefit female victims of violence. Hayek has received Glamour magazine’s Woman of the Year Award in 2001, the Producers Guild of America Celebration of Diversity Award in 2003, the Harvard Foundation Artist of the Year Award in 2006 and most importantly, a place on Time magazine’s 25 Most Influential Hispanics list in 2005. Then she received the Women in Film Lucy Award in 2008 in recognition of her excellence and innovation. Hayek will next appear by providing her voice for the Dreamworks animated feature, Puss in Boots, coming out on November 4th. José Antonio Domínguez Banderas was born in the year 1960 in Spain. When his dream of being a professional soccer player ended at the age of 14, Banderas went on to pursue his interest in acting. He began by acting on stage in a group that traveled all over the country. His stage acting was inspirational and caught the eye of well-renowned Spanish director Pedro Almodóvar who went on to cast Banderas in his 1982 film, “Labyrinth of Passion.” Banderas went on to appear in other projects created and directed by Almodóvar including “Matador” and “Women on the Verge of a Nervous Breakdown.” However it wasn’t until he starred in Almodóvar’s 1990 film “Tie Me Up! Tie Me Down!” that he received Hollywood recognition. Interestingly enough, when Banderas arrived in the United States to act in American films, he only spoke minimal English. His first role in America came when he appeared in the film “The Mambo Kings” in 1992. Even though he was still learning to speak English, he was ultimately praised for this role. Check out the link to watch the trailer. The following year, Banderas appeared in the film “Philadelphia” alongside actor Tom Hanks. It was this film that brought on much of Banderas’ nationwide recognition and his career in Hollywood took off. In the 1990s, Banderas appeared in “Interview with the Vampire” (in 1994 alongside Tom Cruise and Brad Pitt), Desperado (1995 alongside Salma Hayek and Joaquim de Almeida), and Evita (1996 alongside Madonna). However, his iconic role came in 1998 when he was cast as the famous masked hero, Zorro. Though there have been over forty film adaptations of the hero, Banderas is the first Spanish actor to ever portray him. This role brought on many nominations and awards including but not limited to nominations for a Golden Globe for Best Actor in a Motion Picture Musical or Comedy, an ALMA Award for Outstanding Actor in a Feature Film, and he received a European Films Award for Best European Actor and an Imagen Award for Lasting Image Award. The 2000s continued shaping Banderas’ career as he went on to appear in the “Spy Kids” trilogy in the year 2001, in which he was nominated for an ALMA Award for Outstanding Actor in a Motion Picture. In 2003, he starred in Once Upon a Time in Mexico, the last installment of the Mariachi Trilogy which also included Banderas’ film, “Desperado.” He received another Imagen Award, this time for “Best Actor.” In 2003 he starred in “And Starring Pancho Villa as Himself”, “Imagining Argentina”, and he reprised his role as Zorro in the 2005 hit, “The Legend of Zorro”, for which he received another nomination for an Imagen Award for Best Actor. 2004 opened a new venue for Banderas in the way of voice acting when he joined the stellar cast of the “Shrek” series. Banderas made his voice debut in “Shrek 2” as Puss in Boots. This role also brought on several award nominations, roles in “Shrek the Third” and “Shrek Forever After”, and his character’s own film, “Puss in Boots” which is set to bow November 4th. Banderas has accomplished many things in his career as an actor, and he has been honored and recognized in various ways. In 2004, Banderas was awarded with the Rita Moreno HOLA Award for Excellence from the Hispanic Organization of Latin Actors. In 2005, he received the Gabi Lifetime Achievement Award at the Los Angeles Latino International Film Festival and in that same year he received a star on the Hollywood Walk of Fame. Banderas also dedicates much of his time to charity work, and in the year 2002 as a thank you he and his wife, Melanie Griffith, received the Stella Adler Angel Award. Banderas will next be seen in “Puss in Boots”, and he is set to appear in “Haywire”, the action-thriller from Relativity Media set to open January 2012. Emilio Estevez was born in 1962 into a family of artists, the son of actor Martin Sheen and artist Janet Templeton. Forgoing college after his graduation in 1980, Estevez started out like many other actors his age with a debut on stage. In 1982 however, he worked with his father on a TV-film called “In the Custody of Strangers.” Estevez even did the casting for this film. After appearing in “The Outsiders”, Estevez appeared in the cult classic “Repo Man” in 1984, followed closely by both “The Breakfast Club” and “St. Elmo’s Fire” in 1985. Also in that same year, Estevez co-wrote and starred in the drama, “That Was Then, This Is Now”, followed by “Maximum Overdrive” and “Wisdom” in 1986. The 1990s brought on a new venue for Estevez in the way of directing, starting with a 1990 comedy called “Men at Work” that Estevez wrote, directed, and starred in with his brother, Charlie Sheen. Though that movie wasn’t very well critically-acclaimed, it was only two years after that Estevez became the lead role in one of Disney’s most successful franchises, “The Mighty Ducks.” Though Estevez had various other roles in films throughout the ’90s and early 2000s (for example, “Mission: Impossible”, “Dollar for the Dead”, “Late Last Night” and a television appearance on the show “The West Wing”) his most prominent film during the late 90s was “The War at Home”. Currently Estevez is focused on his latest feature film, “The Way”, which is set to bow in the United States next week under his production company, Estevez-Sheen Productions. Written by, produced by and directed by Estevez, this film stars himself and his father in two key roles. Take a look at the trailer below for this drama. Sheila Escovedo, better known as Sheila E, is one of the most accomplished and hottest musicians of her time. Born in 1957, Sheila E’s career began at an incredibly early age when she performed a drum solo in front of 3,000 people at the age of five. 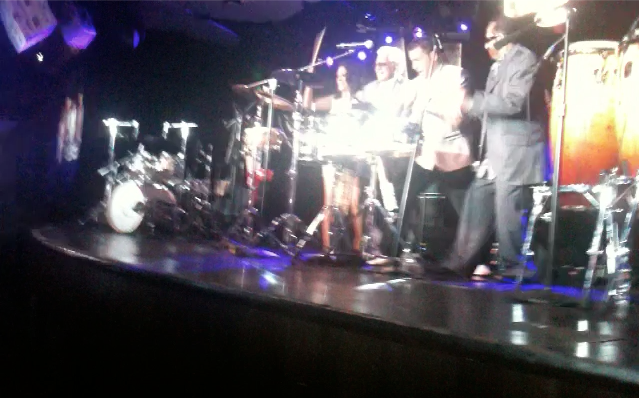 Sheila E’s father, Pete Escovedo, was a great influence on her since he was a famous percussionist who initially played for Santana, and as his vision grew bigger he took steps to launch himself to the next level. 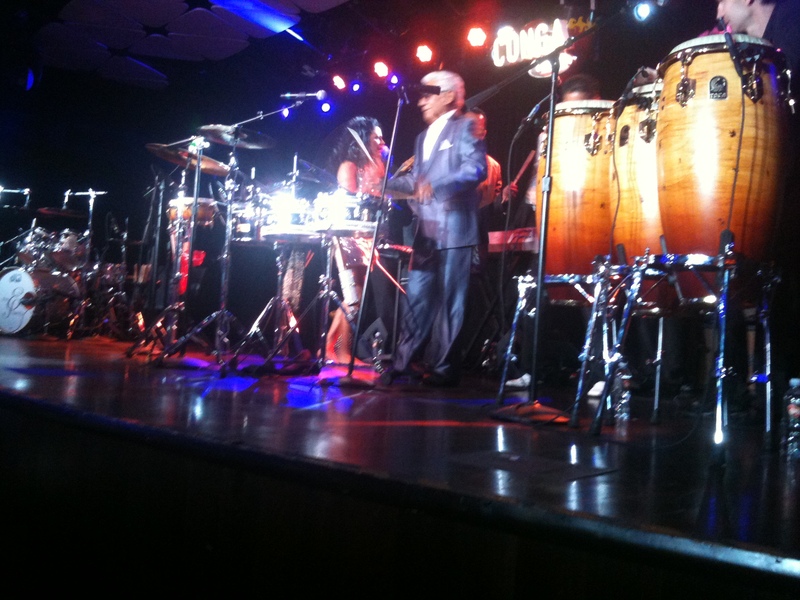 Read more about Sheila E’s fascinating father at http://www.peteescovedo.com/home.html. Sheila E’s official career began when she was 17 years old, recording on the “Yesterday’s Dream” EP with Alphonso Johnson in 1976. She went on to team up and play with artists such as Lionel Richie, Marvin Gaye and Diana Ross. In the late ’70s/early ’80s Sheila E’s career took off when she met Prince. Prince was impressed with her skills that he assisted her on her first solo album, “The Glamorous Life.” From this album came a single by the same name, which went on to not only receive Grammy and American Music Award nominations, but the music video won the MTV Best Video Award. After this, Sheila E joined Prince on his 1984-85 Purple Rain Tour, but she also continued to work on her own projects. Then in the summer of 1985, she released her second album, “Romance 1600”, which also did well and had a chart-topping single called “A Love Bizarre.” Sheila E had her own headlining tour the following spring. Sheila E released two more albums 2000 and 2001 (“Writes of Passage” and “Heaven”) while she continued touring with a variety of other bands. In 2004 she rejoined Prince once again on his Musicology tour. Then in 2006, she toured with Ringo Starr of the Beatles. And over the last decade she has appeared on various soundtracks and presented or performed at various award shows. Sheila E has also contributed her talents to the Pediatric Aids Foundation and USA For Africa’s “We Are the World”, designed for African famine relief. She has created a line of children’s percussion instruments called The Sheila E Player’s series. She has been presented with several awards for her charity work, including but not limited to, the Imagen Foundation’s Humanitarian Award in 2004, the Angels Across America Award in 2004, and the Woman of the Year Award in 2005. 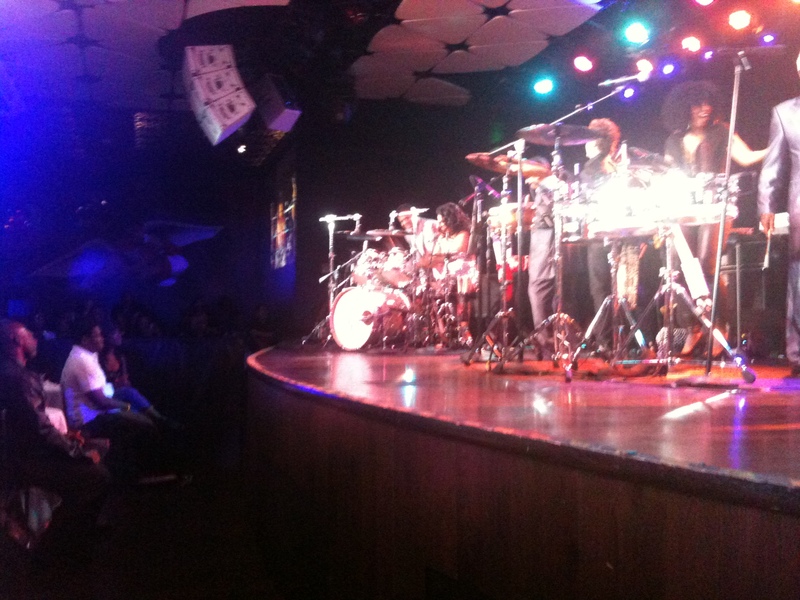 As you many of you know, Sheila E has a band with her brother and father. 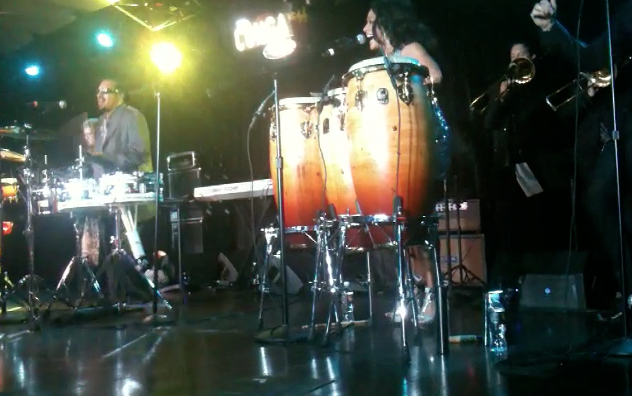 To learn more about the E Family and their music check out http://www.sheilae.com/. The E Family had a launch party of their CD “had a CD launched party at the Conga Room and we have a few images of this event to share with you. Be sure to check iTunes for their CD which is now available for purchase. The E Family is also touring in the Los Angeles this month. See the tour dates for more information. Edward James Olmos was born in 1947 in Los Angeles. Olmos was the son of a Mexican immigrant father and a Mexican-American mother. As a teenager, Olmos was focused on his career as a musician, singing in a rock band called Pacific Ocean and playing in clubs around the Los Angeles area. The band even released a record in 1968. It wasn’t until the late ’60s and early ’70s that Olmos started gravitating toward acting. At first, Olmos wasn’t acting in films but rather made his career as a stage actor, playing parts in small productions. Then in 1979, he made his big break by appearing as the narrator in the first Chicano play on Broadway, “Zoot Suit”, written and directed by Luis Valdez. From this role, Olmos earned a Tony award nomination and later he went on to play the same role in the film version of the show. In the 1980s, Olmos starred in the TV series “Miami Vice” as Lieutenant Martin Castillo. For his portrayal of this character he was awarded a Golden Globe and an Emmy in the year 1985. In 1989 he returned to film, coming back and starring in “Stand and Deliver.” “Stand and Deliver” is based on the story of East LA math teacher Jaime Escalante whom Olmos portrayed. Thanks to this role, Olmos was the first American-born Latino to receive an Academy Award Nomination for the category of Best Actor. In 1992 Olmos was able to add the title of Director to his list of credentials with the making of “American Me”, a film which he also starred in that depicted Chicano gang life in LA. Also in 1995 he starred in “My Family/Mi Familia” alongside other Latino actors including Esai Morales and Jennifer Lopez. Other movies that Olmos has played part in include “In the Time of the Butterflies”, “Walkout”, “Caught”, “Blade Runner”, “Wolfen” and “Selena”, along with roles in televisions shows such as “Battlestar Galactica” and “CSI: NY.” Olmos has contributed much of his time to the Latino community, giving them a chance to have their voices heard. In 1997 he co-founded the Los Angeles Latino International Film Festival and the organization Latino Literacy Now. In 1998 he founded Latino Public Broadcasting, a station that funds public television programming focusing on issues that affect Latinos. Olmos makes around 150 visits annually to places such as delinquent centers and juvenile halls to get out the message that everyone has the opportunity to make their own life choices. Olmos continues to impact the Latino community at large, and it’s safe to say he’s one of the most influential Latinos in the industry.